Safe Inside the Violence, Christopher Irvin’s third book, is a story collection of quiet strength that never stops growing on you as you make progress through it. As he did in his two novellas proceeding this, Federales and Burn Cards, Irvin focuses on what you might call the unnoticed people in life, people who toil and struggle with great resolve but who stand little chance of receiving recognition of any kind. He has a brilliance for capturing individuals caught in a predicament created by complex social forces they had no hand in creating, and he loves to study people doing hazardous jobs that serve people considered important. “Union Man” is the first story in the collection, and it sets the tone for what follows. It’s a period tale about Lem, a working man in a Pennsylvania steel mill town swept up in a strike against management. The unionized strikers man the picket lines in shifts and Lem is supposed to do his part with the others. Much as he cares about the strike and his co-workers, though, he is more concerned with his sick young son nearby at home. A well-dressed union official makes it clear that a doctor who could provide help to his son “is tied to the mill for the duration of the strike”. Lem’s personal worries mean little to the union in the grand scheme of things, but that natty union guy is not above saying that Lem should be ready to fight if need be, to shed blood. The union may not give the medical help it could to his son, but he’s expected to “do the right thing” and to motivate himself by thinking of his son. Similarly in “Vacation Package”, Irvin presents a scenario where a mid-level municipal functionary is being asked to sacrifice for the benefit of something larger than himself, in this case big city politicos who need him to take the fall for somebody else’s wrongdoing. His vacation package, so-called, will be a stint in jail. This story is the shortest in the collection, but captures perfectly the essentials of the Irvin method: he builds a story through a controlled accretion of detail, sometimes a bit elliptically, until, ever so naturally, without shouting at the reader or pushing too hard, he lowers the boom. Not that the boom is always downbeat. Irvin has a mastery of tone that leads to endings you don’t foresee. “Lupe’s Lemon Elixir”, set in the Mexican drug cartel world, builds up considerable tension as the title character goes about her high pressure job cleaning up blood at a murder scene, and how Irvin resolves that tension is priceless. “Nor’ Easter” is a snowy Christmas tale that has a warmth and poignancy matching the mood of the holiday, and “Blind Spot”, about two cops on a stakeout, ends on a note crisply sardonic but still containing strong emotion. Irvin is good with endings in general; he knows how to nail them with just the right twist or final observation, a definitive beat of closure. I can’t think of a story in this book that comes to a halt a line too soon or too late. Each one seems to stop at just the right moment. The cover of Safe Inside the Violence bills the collection as “crime stories”. And it’s true that nearly all the tales have to do with transgression, either criminal or of the social variety. But these are not tales that deal in crime fiction genre tropes so much as they are closely observed character studies smoldering with tension. Violence is rare but severe when it occurs. A neighbor shoveling snow has rarely seemed so irksome and alarming as a man does in “Digging Deep”, but what this story is really about is how a Boston guy with a wife and new baby takes stock of his life by comparing himself to that busy neighbor. The narrator in the title story returns to his childhood house on inheriting it from his father, only to find himself all too at ease with familiar forms of dysfunction. There’s a tale called “Bitter Work” that is somewhat abstract and that reads like a section of a delirious film noir (this story, by the way, has perhaps my favorite single line in the book: “She had a look about her that chiseled a piece off a man’s soul.”), and “Beyond the Sea” is a wrenching mother-son tale that goes into a realm entirely unexpected. Impressive stuff. No one story in the group is like another. And no matter what narrative he is laying out, Irvin is in full command of his material. Not long ago, I was unknowingly photographed on a New York City subway reading an Advanced Reading Copy of this book. The picture, which included my ten year old son, went viral on the Internet, and ever since that day, I’ve been wondering what number of the million plus people who saw the photo took an interest in the book and ordered it from Amazon. I hope many. I’d laugh hard if that were the case. The viral photo was an inadvertent promotion for Chris Irvin’s book, but there’s nothing accidental about this review. 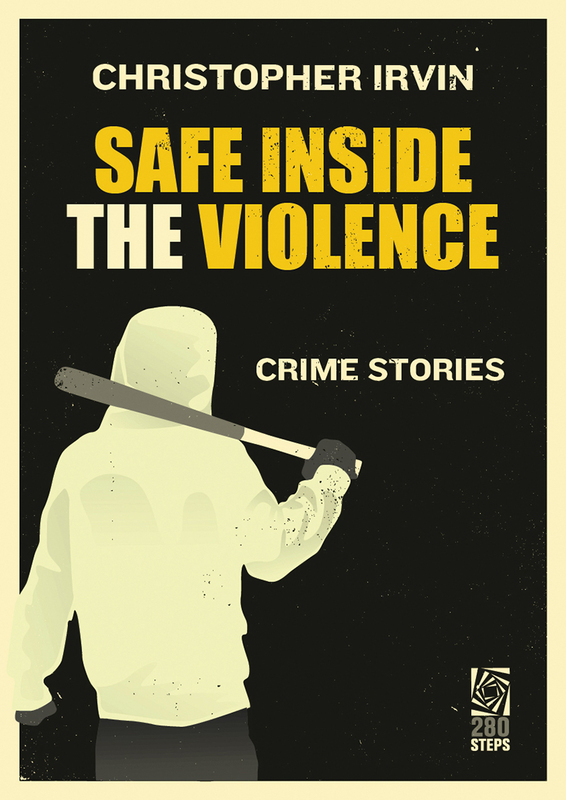 Safe Inside the Violence is a terrific collection, and I hope a lot of people buy it.